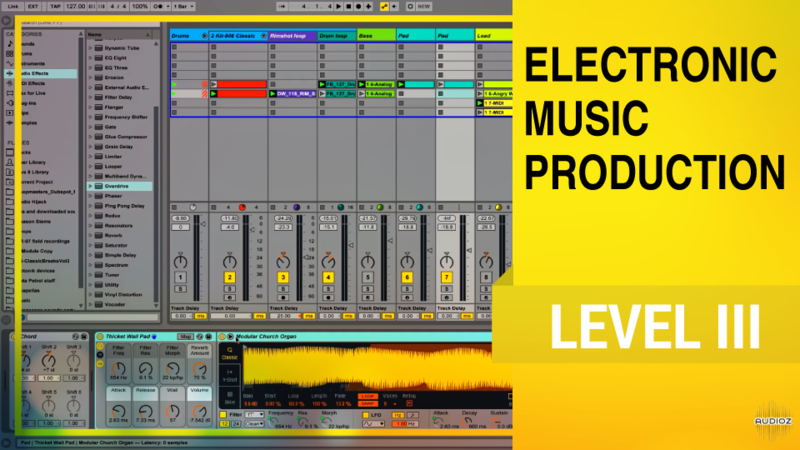 This is the third of 3 courses (Level III) in our beginner Music Production series in Ableton Live. Now that you've completed Level II, you’re on your way to completing your own unique sound and sharing it with the world. In this course you’ll learn about EQing your tracks, working with effects, creative sampling techniques, export settings, and much more. There's a lot of material packed into this course. We'll go over some basic mixing concepts such as unity gain and volume balancing, and the importance of panning and EQing. Things get really fun when you start to understand insert effects and how to work with overdrive, compression, chorus, flanger, phaser, reverb and many other effects. We'll also cover the use of sidechain compression to make your tracks sound even and balanced - an incredibly important concept used by every producer in the industry. You'll also learn about sends/returns, grouping tracks and effects, audio routing, automation, and creative resampling techniques. If you have any desire to get into sound design, or want to make your sounds as unique as possible, resampling your material and mangling it even further is a great way to go about it. By the end of this course you'll be ready to release your songs into the world, and so we'll discuss the ideal export settings. This is the third of 3 courses. In Course 1 you got familiar with the Live interface and working with MIDI instruments and audio material, and in Course 2 you learned composition techniques and basic music theory. After completing this course you’ll be able to combine all of these elements into making a song.